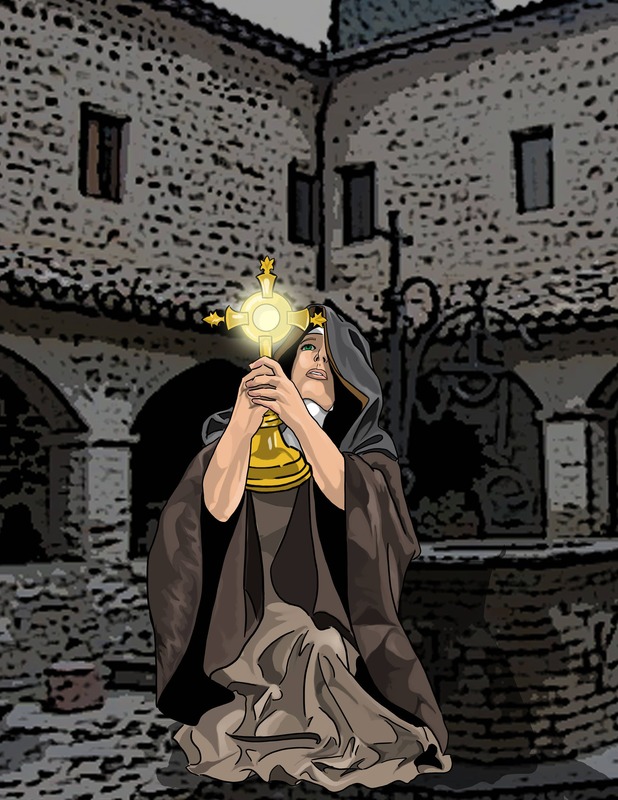 As a young girl St. Clare encountered the dynamic preaching of St. Francis of Assisi. Cut to the core St. Clare abandoned her old life to join the radically austere Franciscans. Clare cut off her golden blonde locks and exchanged her nice clothes for simple brown habit. St. Francis placed her in charged of the women and she became the foundress of what is today known as the Order of Poor Clares. In her old age she turned back an invading force of Muslims with the presence of Jesus Christ in the Eucharist and when she became to infirm to attend mass would have a mystical vision of the mass being said projected on the wall of her cell, this is why she is the patron Saint of Television. A stunning graduation gift for a recent Santa Clara University graduate. Thank you! I love St. Chiara/Clare and I know this depiction of her must please her love of The Eucharist! Well done.